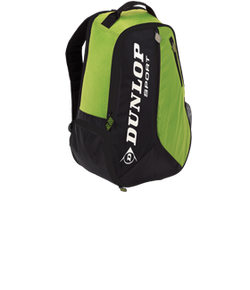 The Dunlop Tour 10 Thermo features 3 compartments capable of holding 10 racquets and other items, an integrated shoe/wet pocket, side panel pocket and ergonomic shoulder straps. This new premium racquet bag is designed with serious players in mind who require enough space to carry plenty of racquets as well as additional items that may be needed. 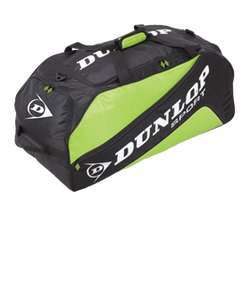 The bag is composed of 3 separate compartments and the central compartment is lined with a thermal insulating layer allowing rackets and drinks to be kept cool in hot conditions. 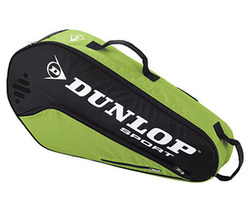 Durable honeycomb rip-stop nylon material gives the bag durability as well as a stylish look. 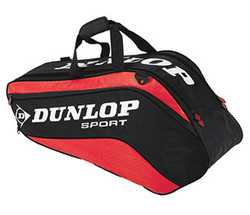 The bag has been ergonomically designed to give added comfort. 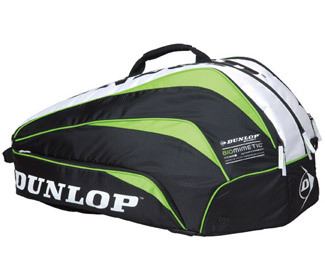 The Dunlop Tour 6 Thermo bag features 2 compartments capable of holding up to 6 racquets and other items, integrated shoe/wet pocket, side panel pocket, and ergonomic shoulder straps. This new premium racquet bag line is designed with serious players in mind who require enough space to carry plenty of racquets as well as accessories. The line is ergonomically designed for better comfort. 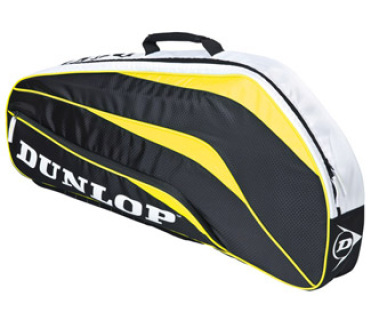 Durable honeycomb rip-stop nylon material gives the line durability as well as a stylish look. 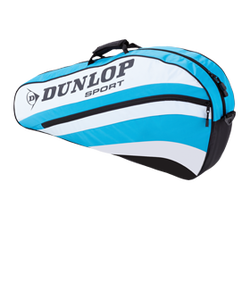 The Dunlop Biomimetic Tour 3-Pack bag is composed of one compartment, which is lined with a thermal insulating layer allowing racquets and drinks to be kept cool in hot conditions. It also features a side pocket with organizer and unique backpack function. 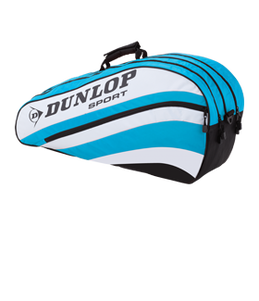 This premium bag is composed of 1 compartment which is lined with a thermal insulating layer allowing rackets and drinks to be kept cool in hot conditions. The padded shoulder strap mean the bag is comfortable to carry and the new stylish design lets players walk onto court with confidence. Also available in 10 and 6 racket options. 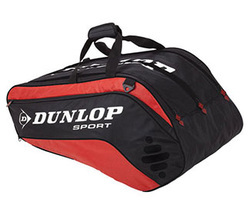 This large holdall is the ideal bag for people who require a durable, practical and stylish holdall for a range of uses. The comfortable shoulder strap makes the bag easy to carry and manouvre and the side handles offer a sturdy alternative. The bag has a large internal wet pocket allowing for dirty towels, cloths or shoes to be stored securely. There is also a large internal mesh pocket for safe storage of keys, mobile phones and other accessories. 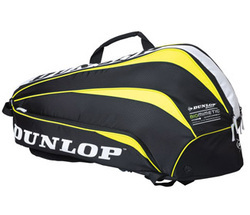 The bag has durable easy glide wheels and a comfortable handle making the bag easy to manage on long trips. 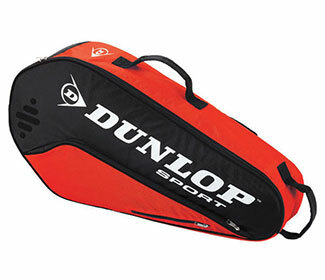 Perfect for carrying a racket or a laptop as well as additional items. This stylish and versatile backpack features two large separate zip compartments with internal mesh pockets for easy storage of accessories. Hard wearing honeycomb rip-stop nylon construction for durability. 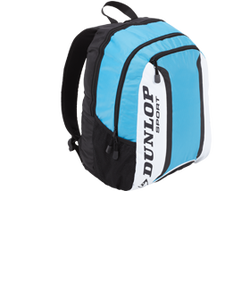 Stylish backpack which is perfect for carrying a variety of items such as clothes, laptops, rackets. The ergonomic shoulder straps make the bag very comfortable to carry for everyday use. Ideal for transporting laptops and other important items. 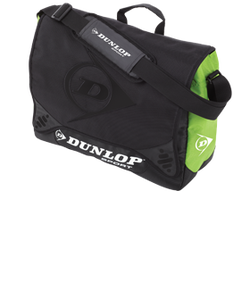 The stylish bag has a comfortable non-slip shoulder strap for added comfort and control, as well as 2 durable handles as an alternative.